Smartphone companies have spent a lot of time and money trying to raise the screen-to-body ratios on their phones without the use of a notch. We've seen punch-hole cameras, side-sliding panels that house the front-facing cameras and sensors, pop-up selfie snappers, and the wedge that is used on the Oppo Reno. Speaking of Oppo, the Chinese phone manufacturer and the brother of OnePlus (they both have the same corporate parent) has other ideas that have surfaced on a patent application. Spotted by LetsGoDigital, it appears that the World Intellectual Property Organization (WIPO) earlier this year published an Oppo patent application titled "Electronic device with display panel." 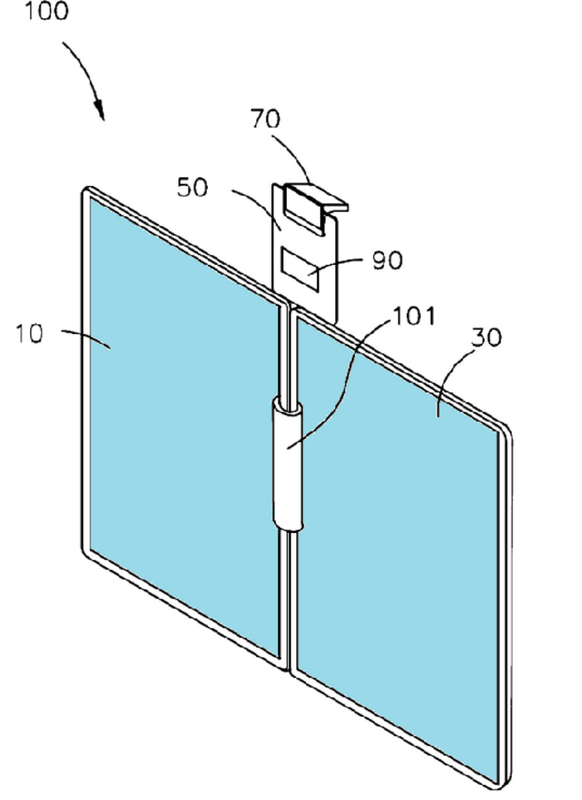 One of the illustrations that accompany the filing shows a handset with a pop-up display. The pop-up screen uses a motor to open and close, and is a thinner and narrower screen than the primary display. The second screen can be used to display virtual controls at the same time that the main screen is showing streaming content. This might also come in handy for someone who plays mobile video games as the pop-up display can be used as a virtual controller. Front-facing cameras and sensors are housed in the thin upper bezel on the phone's full display. Either way, a streaming video or a mobile game can be viewed or played on a full screen with any necessary controls found on the pop-up display. 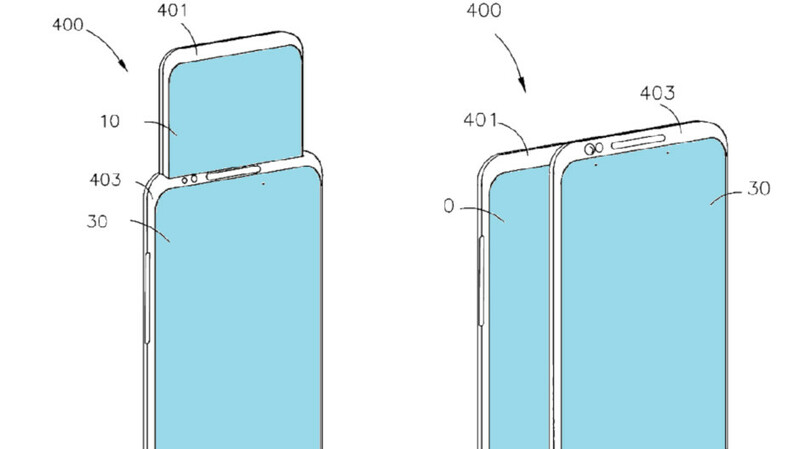 The patent also reveals another design that includes a horizontal side sliding second display. This second display could be used for virtual controls when watching streaming content or playing mobile games in landscape orientation. In this case, the phone is held with the full screen on top and the slide-out screen underneath it. A guide-rail is used to slide the second screen out when in use. Years ago, such designs were used for phones like the Motorola DROID 4, which featured a landscape-oriented physical QWERTY keyboard that would slide out. Another form factor included in the patent shows a smartphone with a second display that swings open with the use of a hinge. Next week, Oppo will officially introduce its new Reno range. At least one of the models in the lineup will employ the company's 10x lossless zoom feature. This allows the user to employ the zoom feature on a photo without any drop off in the quality of the image. The company introduced this technology at MWC in February and said that it would release a phone sporting the 10x lossless zoom feature during the second quarter of this year. At the same time, the company announced that its first 5G enabled handset would also see the light of day in Q2 of 2019. As we mentioned earlier, Oppo and OnePlus have the same corporate parent. As a result, new features found on an Oppo device often make their way to a OnePlus model. Therefore, any of the form factors shown in the patent have to be considered possible designs for a future OnePlus phone. Renders of the OnePlus 7, yet to be announced, reveal that the model will be equipped with a pop-up selfie camera. The sequel to that model, the OnePlus 7T, could be unveiled during the second half of this year. We wouldn't be surprised to see that unit use the wedge to house its front-facing selfie camera and sensors. The form factors seen in the new patent could be used by Oppo later this year or even next year. And of course, there is always the possibility that these designs will never be used by the manufacturer. Oppo is China's second largest smartphone manufacturer trailing only Huawei, and it has announced that it plans on entering the U.S. smartphone market. This move is not imminent as the company first wants to get its European business on solid ground before turning to the states. Yep. Pop up screen break you mean? C'mon. Oneplus won't even put stereo speakers on. "Speaking of Oppo, the Chinese phone manufacturer and the brother of OnePlus (they both have the same corporate parent)" Oppo is not the brother of OnePlus. OnePlus is a full subsidiary of Oppo, basically Oppo fully owns Oneplus. This was proven when documents surfaced a while back even though OnePlus denied the fact. In turn Oppo is owned by BBK along with Vivo, RealMe and Imoo.